Great Britain’s poor swimming performance at the Olympics has in part been blamed on its poor pool facilities. But this is all set to change in time for London 2012 games. When, in 2005, London was announced as the winner of the bid to host the 2012 Olympic Games, the judges’ decision was made in spite of the standard of the nation’s swimming facilities. At that time Great Britain’s were remarkable only in how poor they were for a developed country. Years of under funding and neglect had left the country’s swimming pools in serious crisis. It was estimated that it would take around £500 million to bring the current facilities up to an acceptable standard of repair. This money, however, would only fill in the cracks and clean up the existing facilities, it wouldn’t make up for the fact that the facilities themselves were distinctly lacking. Across the entire country, there were only 19 full length 50-metre swimming pools. As a comparison, Australia – a country with a population almost a third of the size – boasted 49. Of course, a 50-metre pool doesn’t necessarily conform to the Olympic standard. As well as being 50m in length, to qualify a pool must also be 25m wide with a minimum depth of 2.0m at all areas. At that time there were only 3 Olympic-sized pools in the whole of the United Kingdom. These were located at the Aquatic Centre at the John Charles Centre for Sport in Leeds, the Ponds Forge International Sports Centre in Sheffield and at Glasgow’s Tollcross Park Leisure Centre. There were none to be found in London, the actual site of the games. The success of the 2012 Summer Olympics’ bid necessitated immediate action in remedying the issue. However, it was decided that not only the athletes should benefit from the massive swimming pool investment. The government felt it was time the swimming facilities across the country had a complete overhaul. The impetus behind this decision was not only the 2012 games looming on the horizon but also the high profile issue of a nation burdened with a obesity problem. It was decided that encouraging more people to swim was the most realistic way of getting the country more active and healthy in time for the games. 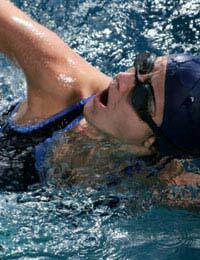 Exercising in the pool is something almost everybody can do regardless of age or lack of fitness, and so it is the most likely sport they will take part in if they are currently inactive. In fact, the only barrier stopping most people is cost. The government therefore decided that in addition to investing in swimming facilities it would also use the money to remove this barrier of entry, and make swimming free for everyone in England by 2012. April 2009 saw the first blossoming of these plans when over-60s and under-16s were granted free admission to public swimming pools in England as part of an £140 million initiative. It was expected that 20 million people would benefit from in the council areas that accepted government funds to help such a scheme. 288 local authorities signed up to provide free facilities for the over-60s at over 1,000 pools, with 207 of those offering it to under-16s as well. Although momentous, the initiative was far from a groundbreaking one. The example was set by Wales when it introduced a similar scheme in November 2004. It was hailed as the first of its kind in Europe. The local councils in Scotland and Northern Ireland are responsible for their own swimming pricing schemes and have yet to introduce a free swimming scheme. Presently a substantial number of Olympic pools have either opened in the meantime or are currently in development. The Cardiff International Pool opened in January 2008, whilst the Sunderland Aquatic Centre opened a few months later. The actual location for the swimming events at the 2012 Olympics will be the London Aquatic Centre, which is due for completion in 2011.